YEARS SURFING: 10+ TRAVELS: Iceland, Mexico, East Coast FAVORITE TRAVEL DESTINATION: Anywhere where I can wear board shorts and barrels FAVORITE FOOD: Pizza LIKES MOST ABOUT SURFING: Being away from everything and catching waves with my friends. *Note* Hunter is a well known surf photographer in New Jersey. His goals are to work as a photographer for a surf magazine. Started Surfing: 12 Travels: Hawaii, Puerto Rico, OBX Favorite Wave and Travel Destination: Wilderness in Puerto Rico Favorite food: coconut and sweet potatoes Likes most about surfing: There is always room for improvement Life goals: Kristen plans to finish school and move somewhere warm with waves and have the flexibility to travel! YEARS TEACHING YOGA: 17+ FAVORITE YOGA TECHNIQUE: Hatha yoga for a physical experience and karma yoga for the devotion to work selfless acts of kindness FAVORITE YOGA POSTURE: Chaakrasana - Wheel Pose FAVORITE TRAVEL DESTINATION: Coast of Georgia FAVORITE CUISINE: Spicy Thai Food and Blueberry Ice Cream LIKES MOST ABOUT YOGA: Sharing my love and passion for yoga with all people - knowing that when we connect with one another and live in the moment - we can ultimately trust of universe, ourselves and God. And to always have fun! *Note* Kristin opened a S.U.P/Yoga class in Rumson called Ohanala which offers classes, rentals and lessons. www.ohanala.com. 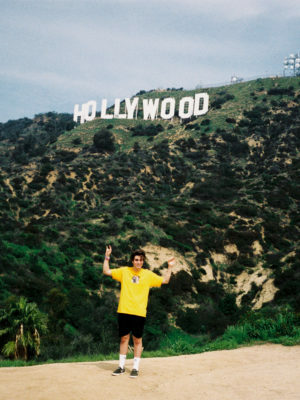 Age: 21 YEARS SURFING: 13+ TRAVELS: California, OBX, Puerto Rico, and South Jersey on one occasion FAVORITE TRAVEL DESTINATION: Puerto Rico FAVORITE FOOD: Burrito LIKES MOST ABOUT SURFING: No two waves are exactly alike. Its always new. *Note* Matt attends college and he plans on being able to live a long, healthy life surfing as much as possible. Age: 37 STARTED SURFING: 1990 YEARS TEACHING SURFING: 20+ TRAVELS: Morocco, Alaska, Nicaragua, Bahamas, Barbados, Saint Lucia, Mexico, California, Hawaii, Tahiti & Moorea, Costa Rica, Dominican Republic, Jamaica, Nova Scotia, Cape Breton, Puerto Rico, South Africa, Ecuador, Northern Sumatra, Australia, New Zealand, Scotland, Spain, France. FAVORITE WAVE & TRAVEL DESTINATION: K Bay in Nova Scotia & Scotland FAVORITE FOOD: My Wife's Italian Dishes LEAST FAVORITE FOOD: Canned Tuna Fish LIKES MOST ABOUT SURFING: Surfing opens up the world. It enables us to see cultures and locations people only dream of seeing. Its a beautiful world out there! 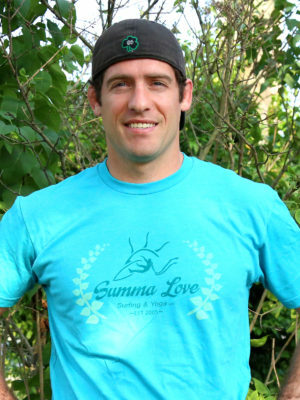 *NOTE* Bryan founded Summa Love Surf Camp and Summa Love Art Studio. His goals are to keep Summa Love going strong, diversify as much as possible, keep traveling, raise a happy/healthy family and never stop learning. He graduated from Monmouth University in 2003 making the Dean's list with a 3.7 GPA. 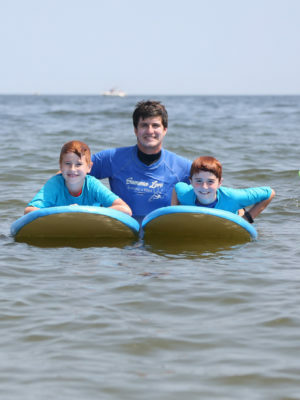 Bryan works as an ASAP art teacher for Rumson Country Day School, art instructor at Summa Love Art Studio, committee member for Clean Ocean Action and Surfer's Environmental Alliance board member. 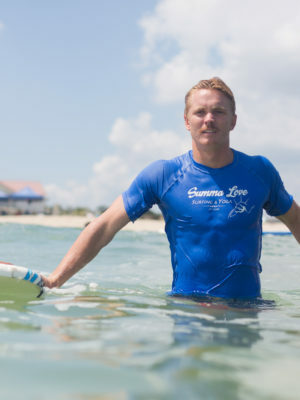 Age: 33 YEARS SURFING: 8+ TRAVELS: Nicaragua, Yellowstone, Thailand, Cambodia FAVORITE WAVE: South swell at "The Strip" FAVORITE FOOD: Anything breakfast LIKES MOST ABOUT SURFING: The challenge and the progression. Getting tubed! *Note* Joe is the manager at our Long Branch location. Joe also started a tutoring service called "Grade A Tutors". He has his masters degree in Educational Administration. He lifeguarded Long Branch for 8 years. He is a physics teacher and high school coach for 10+ years. Joe will be working part time in Long Branch summer 2017. Years surfing: 20 Travels: Hawaii, Indonesia, Barbados, Mexico, Nicaragua, Costa Rica, Puerto Rico, Tortola, and St. Thomas Favorite Wave: Long rights at home and abroad. Favorite Food: Thai Food Least Favorite Food: Mayonnaise Likes most about surfing: The rituals involved. Waking up early. Waxing a new board. Suiting up in the dark. Loading the car. Picking up a friend. Goals: Create more memories with my family. Age: 25 YEARS SURFING: 15+ SPONSORS: Rip Curl, Dragon, Brave TRAVELS: MA, OBX, Florida, South Carolina, Hawaii, California FAVORITE WAVE: Nuns FAVORITE FOOD: Grilled Cheese LIKES MOST ABOUT SURFING: Having fun with my friends! 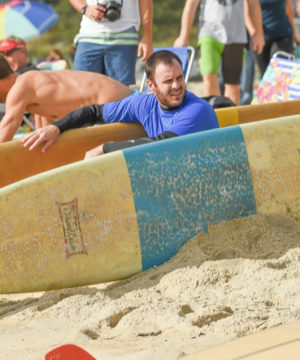 *Note* Chris is outgoing but also a competitive surfer. He wants to travel more and surf as much as possible.